PARENT AND CHILD MUST BE PRESENT. Sponsored by Impact Ministries, Memphis Police Dept. (Old Allen Station), TN Baptist Convention and Commissioner Stephanie Love. 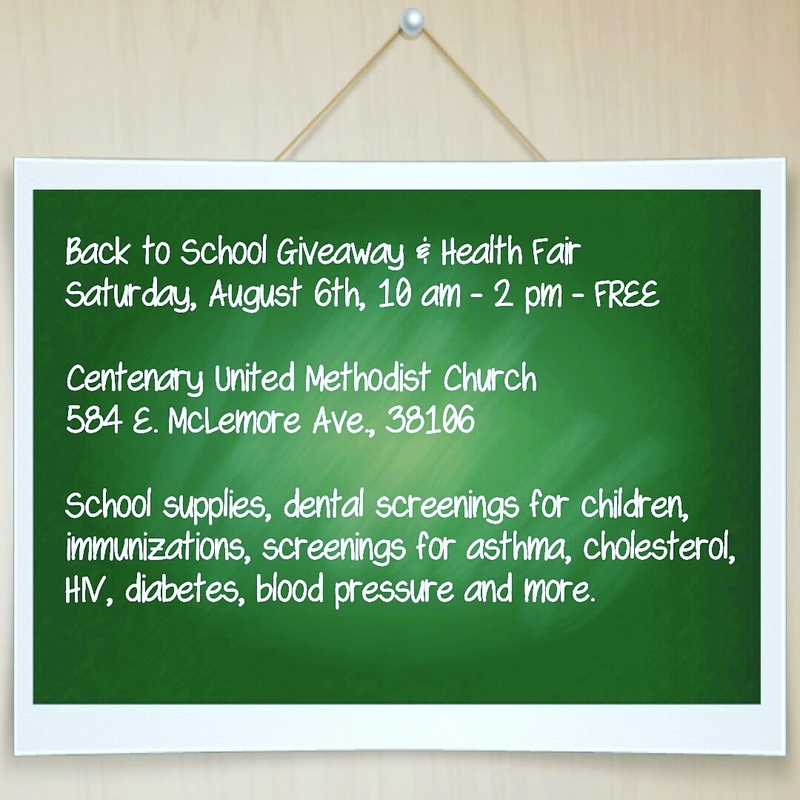 School supplies, dental screenings for children, immunizations, screenings for asthma, cholesterol, HIV, diabetes, blood pressure and more. The Church Health Center offers free Health Education from 5:30-7:30 p.m. each Monday at 1115 Union. Health Education will teach you how to manage your hypertension, cholesterol, or obesity. It’s free and open to community. Registration is not required. Can’t make it on Monday? We also offer a special session from 9-11 a.m. the second Saturday of the month. Registration is required for the Saturday class. Please call901-259-4673 to sign up. The Church Health Center offers free Diabetes Education, a 2-class series that will give you the skills to self-manage your condition. Classes are held each Tuesday from 5:30-7:30 p.m. at Church Health Center Wellness, 1115 Union. Registration is not required, and you may start at any point during the month. Can’t make it on Tuesday? Diabetes Education is presented in its entirety from 9 a.m. to 1 p.m. the secondSaturday of each month. Registration is required for the Saturdaycourse. Please call 901-701-2221 to sign up. The Church Health Center offers free Commit to Quit smoking cessation groups each month. Four-week group sessions start the first Tuesday of every month from 6 p.m. to 7:15 p.m. at Church Health Center Wellness, 1115 Union Ave. Call 901-701-2222 to enroll. Award-winning musician Rev. John Kilzer hosts The Way, a service of recovery, at 6 p.m. every Friday at St. John’s United Methodist Church, 1207 Peabody. The Way focuses on recovery, encouragement, and hope. Music is a key component of the service with many local musicians stopping by to perform. The service, which is a joint ministry of Methodist Healthcare, St. John’s, and the Church Health Center, is free and open to the public. For more information, call 901-726-4104. Together with the National Alliance on Mental Health Memphis (NAMI), the Church Health Center hosts free “With Hope in Mind” classes for families affected by mental illness. Classes are every Wednesday at 5:30 p.m. through March 30 at Church Health Center Wellness, 1115 Union Ave. Learn basic tools needed to cope with caring for adult relatives diagnosed with a mental illness, including problem management, communication, crisis planning, and immediate coping skills for illness cycles. Contact NAMI Memphis at 901-725-0305 to register. March is Lead Poisoning Prevention Month and the Shelby County Health Department’s Lead Poisoning and Prevention Program is committed to educating high-risk communities about the dangers of lead exposure and how lead poisoning can be prevented. In partnership with the Church Health Center, it will host a free Lead Poisoning and Prevention Information Sessionat 12 p.m. on Saturday, March 19 at Church Health Center Wellness, 1115 Union Ave. For more information, please contact Ariel Laws at lawsa@churchhealthcenter.org or 901-701-2241. The Church Health Center is recruiting educators, parents, and those working in children’s ministries to introduce children to healthy foods from 6:30 p.m. to 7 p.m. on March 22 at Church Health Center Wellness, 1115 Union Ave. The Center’s “Alphabet Appetite” curriculum is designed for ages 2-5 to build literacy, improve fine motor skills, increase vocabulary, and enhance development. You will receive a copy of our “Alphabet Appetite” curriculum book for attending this free workshop! To register, contact Kristina Hall at 901-701-2241 or hallkr@churchhealthcenter.org. Healthy, happy living begins at home! The Church Health Center will host a Healthy Living, Happy Living Family Health Fair from 11 a.m. to 1 p.m. on Saturday, April 2 at Church Health Center Wellness, 1115 Union Ave. Local and state health services providers including Universal Parenting Place, Collegiate Life Investing Fund, and the Memphis Police and Fire Department will be on-hand with information and giveaways. For more information, please contact Memphis Madden at maddenm@churchhealthcenter.org or 901-701-2289. Expand your mind for the future! The Church Health Center will host a “My Vision For the Future” Workshop from 5:00 – 6:30 p.m. on Wednesday, April 20 at 1115 Union Ave. At this free workshop, we will set spiritual, physical, and mental goals by creating vision boards. All ages are welcome. Light refreshments and craft materials will be provided. Space is limited. Please contact Ariel Laws at lawsa@churchhealthcenter.org or 901-701-2240 to register. The Church Health Center’s annual community walk and fundraiser Walking as One will take place from 9 a.m. to 12 p.m. on Saturday, April 23 at Church Health Center Wellness, 1115 Union Ave. This year’s celebration features music from The Mighty Souls Brass Band, Amurica photobooth, and food games and entertainment! Registration is $15/ person or free to Church Health Center Wellness members and children 12 and under. Fundraising is happily encouraged! Log on to walkingasone.org to register. Please contact Megan Carolan at carolanm@churchhealthcenter.org or 901-701-2151. The Church Health Center offers free Health Education from 5:30-7:30 p.m. each Monday at 1115 Union. Health Education will teach you how to manage your hypertension, cholesterol, or obesity. It’s free and open to community. Registration is not required. Can’t make it on Monday? We also offer a special session from 9-11 a.m. the second Saturday of the month. Registration is required for the Saturday class. Please call 901-259-4673 to sign up. The Church Health Center offers free Diabetes Education, a 2-class series that will give you the skills to self-manage your condition. Classes are held each Tuesday from 5:30-7:30 p.m. at Church Health Center Wellness, 1115 Union. Registration is not required, and you may start at any point during the month. Can’t make it on Tuesday? Diabetes Education is presented in its entirety from 9 a.m. to 1 p.m. the second Saturday of each month. Registration is required for the Saturday course. Please call 901-701-2221 to sign up. Award-winning musician Rev. John Kilzer hosts The Way, a service of recovery, at 6 p.m. every Friday at St. John’s United Methodist Church, 1207 Peabody Ave. The Way focuses on recovery, encouragement, and hope. Music is a key component of the service with many local musicians stopping by to perform. The service, which is a joint ministry of Methodist Healthcare, St. John’s, and the Church Health Center, is free and open to the public. For more information, call 901-726-4104 or visit www.stjohnsmidtown.org. The Church Health Center hosts a Farmers Market from 10 a.m. to 2 p.m. each Tuesday June through October at 1115 Union Ave. The market features local produce, food trucks, live music, and healthy cooking demonstrations! Credit, debit, cash, and EBT are accepted. For more information, call Jimmy Hoxie at 901-259-4673, ext. 2228 or visit ChurchHealthCenter.org. Rock for Love, the Church Health Center’s annual concert benefit, is Sept. 3 – 6, 2015! The weekend will officially kick off on Sept. 4 with a family-friendly Crosstown Block Party featuring music, food trucks, face painting, a dunk tank, and much, much more. The festivities continue on Saturday at Lafayette’s Music Room with music from Memphis Ukelele Band, Deering & Down, and Hope Clayburn & Soul Scrimmage. The weekend closes out on Sunday with the North Mississippi All-Stars at the Levitt Shell. Log on to rockforlove.org for complete details on locations, times, and entertainment for this FREE event! Get moving this fall! The Church Health Center will host an Urban Fusion Dance Workshop at 12 p.m. on Saturday, Sept. 19 at Church Health Center Wellness, 1115 Union Ave. Open to ages 10 and up, this workshop is an eclectic, expressive, and energetic class where you’ll learn a hip-hop dance with a feel-good vibe from award-winning dance instructor Jaukeem Balcom. Cost is $5 for Church Health Center Wellness members and $10 for community participants. Please wear shirts with sleeves and modest, loose-fitting attire. Contact Kristina Hall at hallkr@churchhealthcenter.org or (901) 701-2241 to register. The Church Health Center invites you to the grand opening of our new community acupuncture clinic from 9 a.m. to 1 p.m. on Saturday, Sept. 19, 1115 Union Ave. Fees are based on a sliding scale of $25-$50 per treatment. You decide what you pay; no proof of income required, no questions asked. Community acupuncture is a nationwide movement to create access to acupuncture by removing the barrier of cost from healing. Please wear loose clothes and be prepared to remove your socks and shoes. Contact Butch Odom at odomb@churchhealthcenter.org or (901) 259-4673, ext. 2109 with any questions. Treat yourself to a time of renewal for your body, mind, and spirit at the Church Health Center’s Restorative Bodywork Workshop! The workshop will meet at 6:30 p.m. on Monday, Sept. 21 at Church Health Center Wellness, 1115 Union Ave. Experience relaxation techniques like yoga nidra, body rolling, and gentle stretching with the guidance of Kimberly Baker. 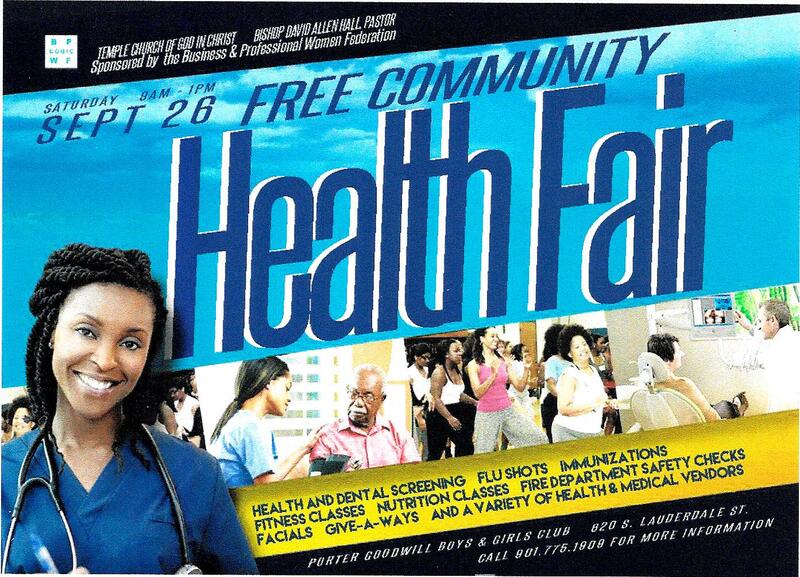 Cost is $5 for Church Health Center Wellness members and $10 for community participants. Please wear shirts with sleeves and modest, loose-fitting attire. Contact Kristina Hall at hallkr@churchhealthcenter.org or (901) 701-2241 to register. We all want the best for the men in our lives. Together with the American Cancer Society, the Church Health Center will host “What Women Need to Know About Men’s Health: A Workshop” at 9 a.m. on Saturday, Sept. 26at 1115 Union Ave. We’ll give you the tools to support the man in your life on his journey toward health. This event is free and open to the public. For more information, call 901-261-8833 or email fco@churchhealthcenter.org. The 14th annual Conference for Clergy and Congregations, presented by St. John’s United Methodist Church, Methodist Le Bonheur Healthcare, and the Church Health Center is Thursday, Oct. 29, 2015 at Church Health Center Wellness, 1115 Union Ave. This year’s conference is focused on the church’s response to violence and will feature keynote speaker Dr. Scott Stoner, director of the Samaritan Foundation for Church and Family Wellness. Admission is free, but space is limited to the first 300 registrants. Deadline to register is October 21, 2015. To register, please call 901-261-8833 or log on to churchhealthcenter.org/faithhealthseries.